Our motto has long been "Keep 'Em In Play," and we do that best with our team kit. The cold therapy team kit contains (1) PI 260 Shoulder Wrap, (1) PI 300 Wrist Wrap, (1) PI 400 Multipurpose Wrap, (1) PI 500 Ankle Wrap and (1) PI 620 Pro Cooler Bag.This combination will treat virtually any acute injury that can happen in sports. No need to borrow a bag of ice from the concession stand when Pro Ice is with the team. The cooler bag keeps the wraps at a consistent temperature for up to eight hours. Simply freeze the wraps ahead of time and take them wherever, whenever needed in the cooler bag. Then, when a player is injured, simply apply the appropriate wrap. Because the wraps don't drip, there is no need for the player to leave the team; he or she can remain to cheer on his or her teammates while benefiting from cold therapy. For players who have repetitive stress motions as part of their position, icing after the game can help their body heal, and keep them ready for the next contest. 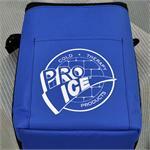 Pro Ice products outperform any cold pack on the market today, delivering a consistent temperature. Compression straps not only help keep the ice where it's needed, they also keep the wrap in place, allowing for mobility while icing. Because they create no mess, Pro Ice can be used on the bus back home as well. This reusable cold pack is easy to hand wash between games, making Pro Ice economical and environmentally friendly. There is no waste that comes with one-time use cold packs. Priced as a package, the kit represents a very cost effective way to have a complete team icing system at your disposal. Ankle strains, sprains or disorders of the foot such as injured Achilles tendon or plantar fasciitis all can benefit from icing. Find non-toxic pain relief with the Pro Ice cold therapy ankle wrap. Prevent long-term damage from repetitive stress injuries.